Your prized vehicle deserves the best. That’s Ceramic Pro. Unlike other paint protection products, the range has been extensively tested by SGS, the world’s leading independent testing body. It achieved the highest possible result in every category — hardness, flexibility, adhesion and performance. So you don’t have to take our word for it. The figures speak for themselves. Hardness is measured in terms of ‘H’. Normal clear coat has hardness levels between two and four H. Ceramic Pro, once cured, measures at above nine H. That makes it more than twice as effective as the best top coat on the market — and literally, the hardest top coating available anywhere in the world. Once a Ceramic Pro coating has been applied and cured, it doesn’t degrade. Unlike sealants and waxes, it can only be removed by deliberate abrasion, like wet sanding. That means it provides permanent protection for as long as it’s properly maintained. When you’ve invested in a beautiful vehicle, you want to keep it that way. Which is why the Ceramic Pro range can be used inside and out to protect paint, polymers, glass, vinyl, alloys, fabric, leather, plastic and rubber. Ceramic Pro coatings bond to surfaces at a molecular level, filling in nano-pores to create a hydrophobic, diamond-hard, totally impervious surface. As well as protecting against contaminants, they’re self-cleaning. Water grabs the contaminants, and simply rolls off the hydrophobic surface. There’s no other product in the world that performs like Ceramic Pro. So when it comes to protecting your vehicle — and your investment — why use anything other than the best? The coating will protect the vehicle’s exterior and interior from deteriorating for a lifetime. The resale market value will therefore be substantially higher! 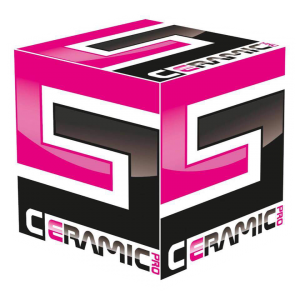 Ceramic Pro pays for itself in the end. Once the coating is applied you will see a mirror effect, glossiness and color depth, incomparable to anything else! With proper maintenance your car’s finish will shine for many years to come. The slick coated surface won’t allow dirt, brake dust and tar to stick to your paint, wheels or glass. This makes washing your vehicle less labor intensive and less frequent. Waxing is now obsolete. Ceramic Pro products can only be applied by Professional Approved Applicators.